For too long Los Angeles had zero cat cafes. These were dark days in which the have-nots had to rely on the cats of friends or staring at kitties through the cat condos at PetCo in order to get their feline fix. Now, however, Los Angeles is home not one, but two cat cafes. Both are full of adoptable kitties in search of their forever homes. Which cat cafe is right for you? To judge is a fool’s errand, as both are alike in dignity. Yet, if you must, here’s how they compare. 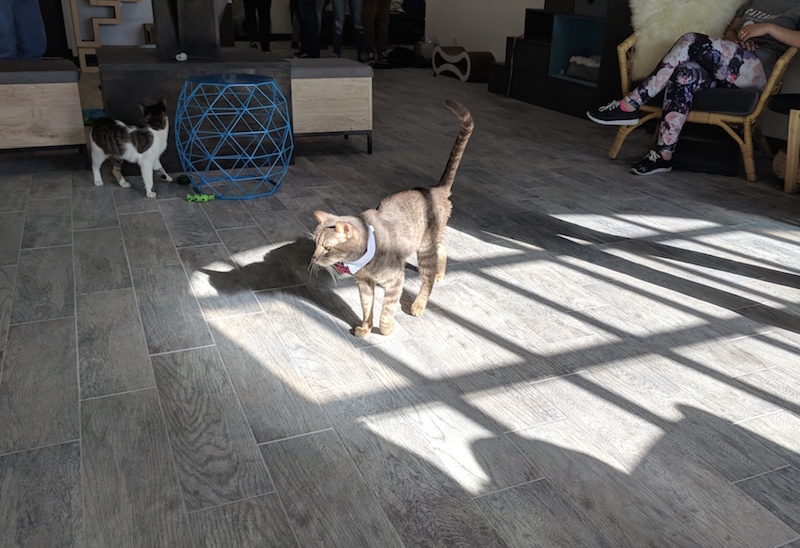 CatCafe Lounge is a nonprofit cat cafe located in West L.A. They’ve partnered with SNPLA to offer guests a chance to visit with adoptable cats. All entry fees are tax detectable, and all of the proceeds go to saving and socializing cats. Hours: Every day except Tuesdays, 11 a.m to 8 p.m. Cost: All reservations can be made online. Standard entry is $25/60 minutes (includes free coffee/tea). On weekdays from 11 a.m. to 5 p.m., $30 will get you a four-hour study session in the lounge. And yes, they do have free Wi-Fi. 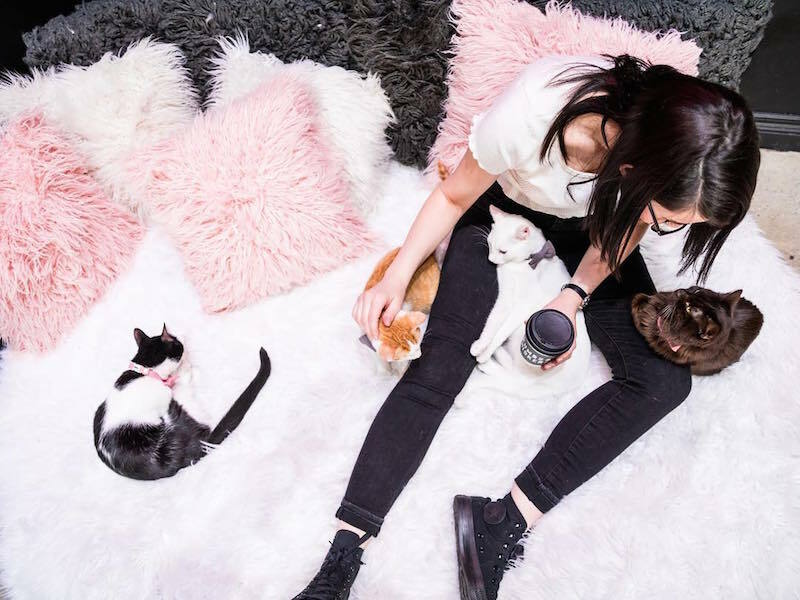 The lounge also occasionally hosts “kitten showers,” where SNPLA will bring adoptable kittens to meet and offer tips on fostering and caring for neonatal and young cats. These events are also $25/person. Student and group discounts are available. The Space: CatCafe Lounge is quite large. You’ll enter up a flight of steps painted with yellow paw prints and proceed to the cafe. This area is kept completely separate from the cats. The lounge is a sunny, second-floor space with lots of natural light, several cozy couches and chairs, and multiple areas for cats to play, climb, and, if they so choose, hide. This means curious cats can greet you and play, while sleepy ones can tuck away for a nap. The Cafe: The entry fee entitles each customer to one free coffee or tea. They also serve cold brew and kombucha and a variety of snacks, with many vegan-friendly options. 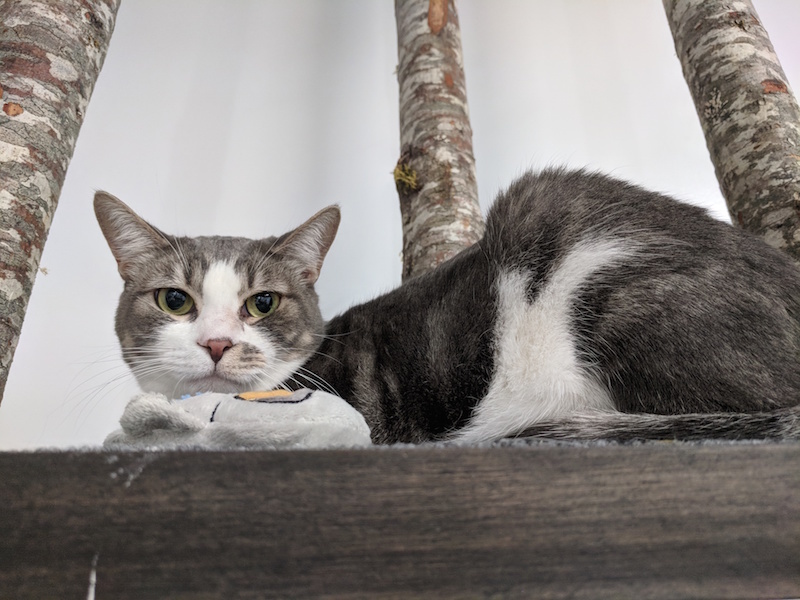 The Cats: CatCafe Lounge has some 25 cats at a time. As they focus predominantly on at-risk cats who might otherwise be euthanized at crowded shelters, you’ll find mostly adult cats here. (There were two kittens present when we visited.) Some of the cats are a bit shy, but most are friendly and more than happy to sit in your lap or receive pets. If you are looking to adopt, you’ll be able to see how the cats behave around other people and animals. If you’re just looking to pet some cats, that’s great too, as socializing animals is an important part of the adoption process. Crumbs & Whiskers is a D.C. import that opened an outpost on Melrose in 2016. Like CatCafe Lounge, all cats are adoptable via their partner, Stray Cat Alliance Cat Rescue. Hours: Every day except Wednesday, 11 a.m. to 7:45 p.m. The Cost: All reservations can be made online. Standard entry is $22/70 minutes on weekdays, or $25/70 minutes on weekends. C&W also hosts special events, such as cat yoga on Sundays ($30) or BYOB wine and comedy events. The Cafe: All food and drinks served at Crumbs & Whiskey come courtesy of Open Space Cafe Theater. They include coffee, tea, espresso, lemonade, cold brew, and hot chocolate, and snacks like cookies, yogurt, and chai pudding. A full menu can be accessed here. Most items cost between $3 and $5. The Cats: All cats are at-risk cats rescued by Stray Cat Alliance Cat Rescue. There are typically about 15 to 20 cats at a time of various ages. Sometimes you can see who’s there on C&W’s website, though be aware that sometimes a cat gets adopted before the website is changed. Most are friendly and curious, and there are plenty of toys available to play entice them into play. Now, if you’re thinking, ‘this is great, but I prefer dogs,’ you’re in luck. The Dog Cafe in Rampart Village allows you to play and pet adoptable dogs for $15/hour (drinks sold separately).